The Kettle Valley Golf Club is a nine-hole golf course situated in the middle of the scenic Kettle Valley, between the Village of Midway and the community of Rock Creek. The course offers scenic vistas of rangeland, rolling ponderosa pine, and larch covered hills alongside the beautiful Kettle River. Visitors and members are both welcome to play the challenging and enjoyable course that is suited for all skill levels. Phoenix Mountain Ski Hill, nestled in the mountains just Northwest of Grand Forks, is a regular destination for local ski and board enthusiasts alike during its winter months. Pheonix provides terrain, serviced by a T-bar, for all skill levels ranging from beginner to advanced skiers and snowboarders. Mt. 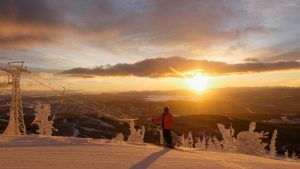 Baldy Ski Area is located on the mountaintops of the Okanagan-Similkameen and Boundary-Kootenay regions of BC is just minutes away from the communities of Oliver, Osoyoos, Penticton, Rock Creek, and Midway. The ski area includes the Eagle Double Chair, the McKinney T-bar, a magic carpet, and the Sugar Lump Quad Chair and offers terrain for all skill levels. Cross Country Skiing and snowshoe trails are also available.